It's friday what do you want? After the singularity, even your toilet will be transformed. Maybe it will look like this fabulous, googie/populuxe toilet or maybe it will be made of converted T-1000 liquid terminators who can morph to fit any rear end — whether Wookiee or Gray Alien. What else does the far future promise us in the way of toilet technologies? Well, I'm glad you asked that question. The future begins at home, and there's nothing more homey than a toilet so advanced that it wants to vote in the next election. Perhaps your toilet will look something like this award-winning, sleek Russian toilet, dubbed the Mrs. Hudson and designed to look like a drop of water. Could be a prop from the original Russian version of Solaris. Discerning readers will no doubt recognize it as a larger version of the glass pipe they bought on Haight Street or maybe in Chelsea. "Washup" is a conceptual design by Sevin Coskun from Turkey integrating washing machine with toilet flush. It suggests a sustainable water consumption by storing the wasted water in toilette-flush tank and reuse it with flushing. Moreover, "Washup" brings a solution for the problem of location of washing machines in small bathrooms, overlapping washing machine usage space with toilette usage space. In your post-singularity existence, after living 500 years, you'll need an executive class toilet to distinguish yourself from the mutant underclasses who actually clean your toilet for you. That's why we've got this model, which looks like an executive's leather chair, complete with ergonomic computer and phone setup, and a nice poop hole in the center. 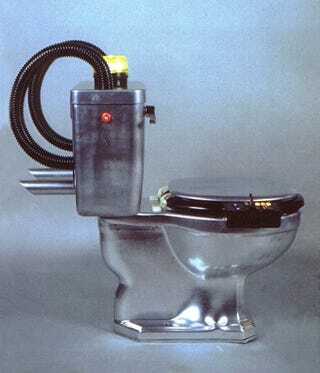 And of course, every post-singularity toilet needs to be self-cleaning. This particular model, demonstrated by a wildly-happy user (don't worry — he doesn't overshare), cleans itself in a way that looks at first as if the toilet bowl is breathing. But that's just a trick of the eye. It's merely rotating.